William Bell in Take me to the River. Directed by Martin Shore. Opens Friday. There's been no shortage of tuneful movies lately, but Martin Shore's Take Me to the River has one or two secret weapons that make it stand out in the crowd. Any "roots R&B" documentary that can get Mavis Staples, Snoop Dogg, Booker T. Jones, Bobby "Blue" Bland, and Otis Clay into the studio for live sessions in front of a camera is noteworthy right from the start. But then, Memphis is a special place. That quintessential Mississippi River town is a legitimate claimant — alongside New Orleans, Nashville, and Austin — as one of the all-time music capitals of the South, the home of countless singers, instrumentalists, and songwriters pumping out blues, rock, soul, and rap. B.B. King, Elvis Presley, Otis Redding, Isaac Hayes, the Staple Singers, Al Green, Wilson Pickett, Booker T. & the MGs — the list goes on and on. In the days when Stax, Hi, and Sun Records were in high gear, the city was a pot of hot funk. In the words of one recording pro in the documentary, "You could feel the soul in the streets." Best of all, at the height of the civil rights movement of the 1960s, when racial tensions were boiling over in the US, black and white performers worked side-by-side in Memphis. During his career as a drummer, music producer, and movie music supervisor, Shore worked at pianist Jim Dickinson's Zebra Ranch recording studio outside Memphis and fell in love with the "real, genuine, straight-from-the-heart" music of the region. 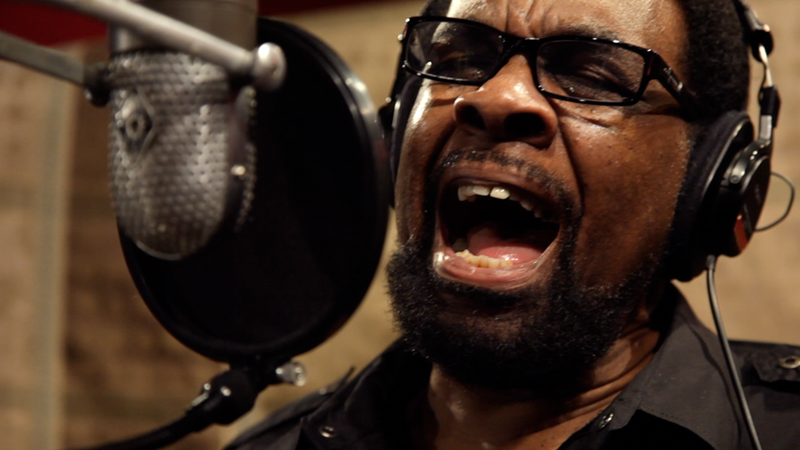 Filmmaker Shore's goal in Take Me to the River is to pay tribute to the late Dickinson and other Memphis music makers by introducing a few living R&B legends of the Sixties and Seventies to some contemporary hip-hop performers who share their point of view, in a real working studio session, cinéma-vérité style. The "living" part of the concept is key to the enterprise. Many R&B stars from back in the day are no longer with us, and Shore — collaborating with Dickinson's music-playing sons Cody and Luther and their band, the North Mississippi Allstars — wanted to capture the surviving artists on video while he still could. Rather than just cover the old hit arrangements, though, Shore and his crew aimed to create new music, a hybrid of classic R&B with the contemporary Memphis-style rap of performers like Al Kapone and twelve-year-old Benjamin "Lil' P-Nut" Flores. Great idea, funky music. Keyboard king Booker T. and Kapone get together for "Supposed to Be." Singer Bobby Rush and rapper Frayser Boy do a knockout version of Rufus Thomas' "Push and Pull," with Rush on blues harp, plus fabled sessions guitarist Charles "Skip" Pitts (his wah-wah pedal set the mood for Isaac Hayes' "Shaft"). Soul crooner Bobby "Blue" Bland, in one of his last appearances before his death in 2013, does his best to relate to gangsta rapper Yo Gotti on "Ain't No Sunshine." We get up close with songwriter David Porter (he wrote the lyrics for Sam & Dave's "Soul Man"), Stax Records' William Bell, and Charlie Musselwhite, virtuoso of the blues harmonica. Singer Robert Plant shows up to explain why he and Led Zeppelin, among many British acts, came to Memphis to record. Actor Terrence Howard serves as the film's on-screen narrator and also sings "Walk Away" with the Hi Rhythm Section, including Mabon "Teenie" Hodges on guitar. Of the ten tunes recorded for the movie, the most electrifying is Mavis Staples' one-take rendition of the Staple Singers' "Wish I Had Answered," backed by the Dickinson brothers. But the movie's "aww" moment comes when veteran Bland patiently teaches Lil' P-Nut how to sing "I Got a Woman." Perhaps unsurprisingly, each of the generations of performers in the doc initially had its misconceptions about the other. The old school blamed high-tech recording software for enabling people who couldn't sing or play (ouch!) to make records. Most of the young rappers had never heard of the older stars, even when they lived a few blocks away from each other. But once they met and explored their common roots, everything fit together. Take Me to the River is a must for music lovers.